At Twin Peaks Dentistry, we are passionate about making smiles beautiful. 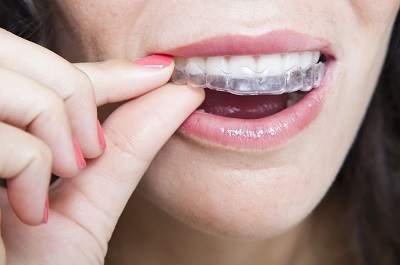 Invisalign® clear braces are an effective and convenient way to straighten teeth whether you experience crookedness, gaps, or an uneven dental appearance. Ziba Shirazi, DMD, and Robert Beavers, DMD, offer Invisalign treatment for teens and adults, allowing them to obtain a uniform smile quickly and with many esthetic benefits. If you are interested in improving the look of your teeth, visit our dental practice in Poway for Invisalign clear aligners. How Does Invisalign Treatment Benefit my Smile? Invisalign aligners correct teeth using an approach similar to traditional braces. Aligners, however, are made from clear plastic and fit over teeth for an appealing and comfortable treatment. They put mild pressure on teeth, shifting them into the proper place. If worn for at least 22 hours a day, Invisalign wearers will see results in a few months’ time and may complete treatment within two years. You can remove them at any time, which is particularly convenient for mealtimes and those special events where you need the full beauty of your smile. Many teens and adults do not need a full braces treatment, and the metal brackets can cause dental issues such as decay, which is why the clean and easy-to-maintain Invisalign treatment is a viable alternative. It may not be right for everyone, however, and patients who are looking for Invisalign need to have a consultation to make sure it can fulfill their needs. The aligners are made from moldings taken from your own smile, which ensures a precise and customized fit. When our Poway dentists create the treatment plan, they know exactly how teeth need to be shifted and make sure any alignment issues are addressed. Patients are given a few sets of aligners at a time, which must be changed out every two weeks. When patients have completed the set, they are given the next one, which is how treatment advances. This process requires Invisalign patients to be diligent in wearing their aligners, otherwise, they will not achieve desired results. Teenagers must be responsible for the aligners and the treatment process in order to obtain lasting results. When treatment is complete, patients have a smile to be proud of, one that has a better bite and grants improved access when brushing and flossing. Their smile will feel better, look more attractive, and function more efficiently. Dr. Shirazi and her team believe in the results that Invisalign clear aligners produce, and their experience with this orthodontic method ensure greater success. We want all eligible patients to see how Invisalign can change their smile. Call us to schedule your first consultation and experience our professional and compassionate care.